Fiji Roads Authority Chief Executive Officer John Hutchinson says that FRA is progressing with work on the Kasavu Slip to re-open Kings Road to motorists by mid May 2017. Mr Hutchinson says that FRA has appointed Fulton Hogan Hiways (FHH) to go ahead with assembling and installing the modular steel bridge at Kasavu. In an earlier press statement Mr Hutchinson says that this set up will permit buses and heavy vehicles operating at legal loads to use the Kings Rd. This bridge solution will be a single lane for buses, cars and trucks and it will be controlled by solar powered traffic lights. Mr Hutchinson also highlighted concerns about the unruly behavior of motorists and some citizens at the slip site. Last week, a five day training session on the safe handling on bailey bridges and its assembly was held at the Fulton Hogan Hiways Rew a depot where the FRA stock of bailey bridges is currently stacked. Steve Morgan from Mabey Bridge Limited in the United Kingdom travelled to Fiji to host the training session that was attended by engineers from FRA, FHH, Republic of Military Forces and China Railway First Group. Mr Hutchinson says that the training provided by Mabey Bridge Limited is a hands on approach to get our people and the industry skilled on assembling bailey bridges. Mr Hutchinson also adds that Bailey bridges offer a low cost, effective and robust bridging solution, that if we ll maintained will last for many years. 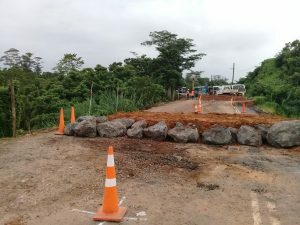 The Fiji Roads Authority is advising members of the public to take extra care when in the area and for motorists to continue using Bau Tikina road until Kings Road is re-opened in May. Members of the public are requested to contact Fiji Roads Authority on 5720 to lodge their concerns or seek feedback on road related matters.